Along I-40 just west of Nashville, the thump-thump-thump echoes from TruForm Way, the newly named street where TruForm Manufacturing LLC stamps and assembles components destined for appliance OEMs and automotive Tier One customers. The rhythm tells you that TruForm is busy. Fact is, TruForm has grown busier every year since the late-2000s recession. This new 660-ton mechanical-press line will help TruForm Manufacturing LLC meet increased demand for automotive parts. The controls are fully integrated with the new 660-ton press as well as the feed line and scrap system, allowing for simplified installation and operation. They also assist in quick die change, a must for TruForm’s JIT production. Able to handle coil widths to 48 in. 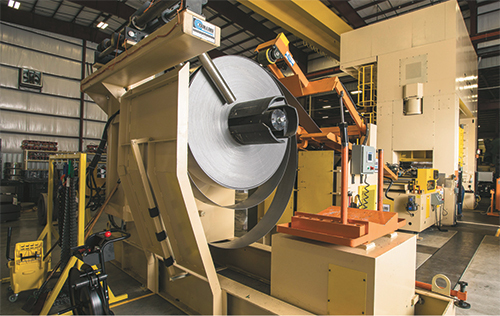 and easily remove partial coils on the 660-ton press is a space-saving coil-feeder, which also provides straightening capability for stainless and high-strength steel. 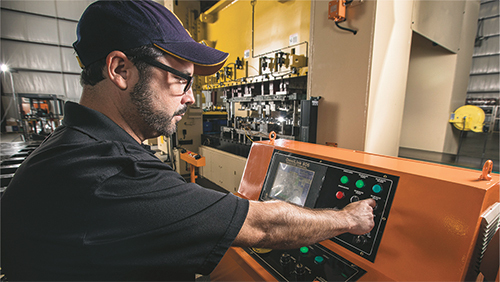 TruForm’s seasoned toolroom personnel along with apprentices from an inhouse program keep the company’s complex progressive dies in working order. A preventive-maintenance program stored in TruForm’s ERP system automatically details tool-maintenance schedules and provides to-do checklists. 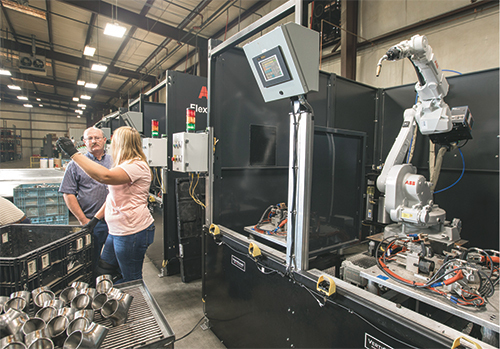 Beyond new presses, TruForm’s capital-spending surge has netted other state-of-the-art production equipment, such as these robotic-welding booths. The company opened its doors in 1999 with two 200-ton presses in a 20,000-sq.-ft. plant. Expansions followed, and significant growth occurred after its purchase by Sisler Manufacturing Group in 2012. With its new owners, Jon and Brett Sisler, experienced in the appliance industry, TruForm took on that sector to augment what had been until that point a 100-percent automotive-supply business. A capital infusion followed, with TruForm growing in size from 40,000 sq. ft. at the time of sale to nearly 100,000 sq. ft. under roof in adjacent buildings today. The campus has room to grow even further, as the company owns several acres of land on the site. 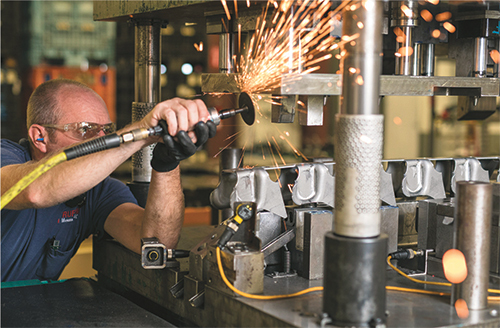 Within its expanding space, TruForm and its 96 employees across two shifts provide progressive-die stamping, robotic and resistance gas-metal-arc welding, and assembly. In late-2015, new automotive work, slated to begin in summer 2018, prompted the company to explore added press capacity. TruForm supplies appliance OEMs on the order of 4-million-plus primarily complex hinge and lever mechanisms per year, while supplying automotive Tier Ones with console brackets as well as instrument-panel and exhaust components in typical volumes between 100,000 and 350,000 units annually. Today, the appliance-automotive mix hovers around 50/50, with next year seeing automotive comprise about 70 percent of the company’s production after launch of the 2019 Nissan Altima program. Stamped-part materials include stainless and carbon steels, including high-strength grades, in thicknesses from 0.02 to 0.20 in. The TruForm team investigated potential presses from December 2015 to March 2016. 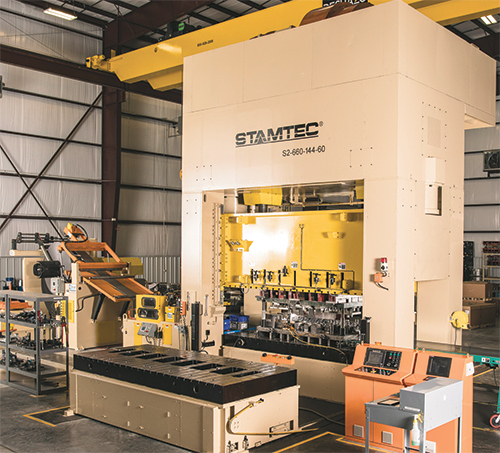 After performing its due diligence, TruForm opted for 330- and 660-ton mechanical presses, both from Stamtec (www.stamtec.com), Manchester, TN. A third 660-ton press is under construction and due to ship to TruForm by the end of the year. “We visited some of our large customers using Stamtec presses, and their feedback finalized the decision for us,” Beaton says. On top of that, visits to Stamtec’s manufacturing facility in Taiwan confirmed the use of stringent weld procedures, stress-relief efforts and 100-percent weld inspection on press frames, as well as other significant quality inspections prior to sign off of equipment to the customer. The visits eased TruForm’s collective mind that the presses would stand up in a harsh, demanding stamping environment. The two 660-ton presses feature longer-than standard beds, 144 by 60 in., as does the 330-ton machine, with a 120 by 48-in. bed. With two Dallas Industries SpaceSaver coil-feed lines on existing presses, TruForm opted for those again on the new 660- and 330-ton presses, and has done the same for the 660-ton press on order. Beaton notes the close working relationship between Dallas and Stamtec and the lines’ compatibility with the Link Systems controls. The feed lines, he says, can handle coils from 2 to 48 in. wide, which, again, offers flexibility when quoting new work. Every press at TruForm, including the new units, feature fall-through-the-bolster scrap removal via a Wardcraft Conveyor scrap system. Company engineers worked with Wardcraft and Stamtec to design scrap chutes into the new presses, ensuring compatibility, reports Beaton. Citing the unique demands inherent in JIT production, TruForm opted for rolling bolsters to assist with die changeover. Described as a 100-percent progressive-die operation, TruForm puts much effort into keeping the complex tooling in working order. Though it sources dies from outside partners, the company has a fully outfitted die shop with 10 tool and diemakers as well as two apprentices (via TruForm’s inhouse tool-and-die apprenticeship program). The new presses have just begun production, but according to Beaton, TruForm will have to add employees through the new year and the ramp up of the new automotive work to support 2019-model-year passenger vehicles.